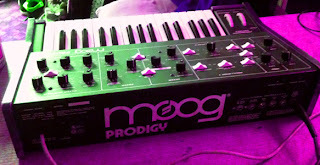 A nice Moog Prodigy in for a service & minor surgery - it's one of the later models with interface jacks on the back panel... these make it quite a flexible machine. The user wanted the S-trig converted to a standard positive going gate signal, so a 1/4" jack socket replaced the Cinch Jones connector and a small circuit added inside... no cosmetic alterations and completely reversible if needed. A 'silent' VCO was brought back to life with a CA3046 transplant, and after a general clean and calibration the Prod sounds great.